LOS ANGELES, CA--(Marketwired - May 3, 2016) - For nearly 60 years The Thalians, led by Debbie Reynolds and Ruta Lee, have raised over $35 million for mental health related causes. A majority of the contributions have come through The Thalians Annual Galas, a Who's Who of the Hollywood elite honoring a Mr. or Ms. Wonderful with an award designed by Walt Disney himself. The coveted trophy is given to a member of the entertainment industry not only for their work on stage and screen but also for their behind-the-scenes philanthropy. A partial list of the honorees includes Frank Sinatra, Mary Martin, Lana Turner, Ed Sullivan, Shirley MacLaine, Gene Kelly, Sammy Davis, Jr., Lucille Ball, Bing Crosby, Bob Hope, James Stewart, Rita Hayworth, Count Basie, Liza Minnelli, Carol Channing, Carol Burnett, Sally Field, Mary Tyler Moore, Whoopi Goldberg, Red Buttons, Clint Eastwood, Mickey Rooney, Hugh Hefner, and Smokey Robinson, to name a few. 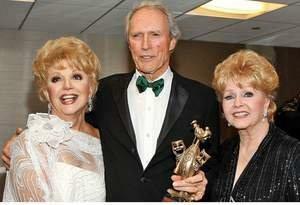 Debbie Reynolds, who was recently honored with the Academy of Motion Picture Arts and Sciences' Jean Hersholt Humanitarian Award, said, "We are thrilled that the Academy Film Archive will officially preserve The Thalians one-of-a-kind collection of Hollywood history that has served to help so many families heal the invisible wounds of mental health diseases." Most of The Thalians Galas, since 1955, have been filmed and videotaped. The footage contains many unforgettable moments, like Red Buttons' standup routine introducing Lana Turner, and Sammy Davis breaking into song during his acceptance speech of his Mr. Wonderful Award. Many stars have attended and/or appeared at these events including Fred Astaire, Charles Bronson, Doris Day, Marvin Hamlisch, Peggy Lee, Bette Midler, Leonard Nimoy, Don Rickles, Tom Selleck and Raquel Welch. The Academy Film Archive was established in 1991 to oversee the Academy of Motion Picture Arts and Sciences' cultural and educational activities including the preservation, restoration and study of motion pictures. The Archive holds over 190,000 items, including Academy Award® winning and nominated films, the annual Oscar® telecasts since 1949, behind-the-scenes footage, home movies, and the personal collections of Alfred Hitchcock, Howard Hughes, Cecil B. DeMille, John Huston and Sydney Pollack among many more. With the help of the funds raised at The Thalians most recent galas, chaired by Kira & Bob Lorsch, along with a million dollar gift from the Margie and Robert E. Petersen Foundation, The Thalians are now focused on mental health and wellness programs for America's wounded service men and women and their families served by UCLA Operation Mend. "The Thalians are alive and well, continuing to support the mental health needs of our brave military men and women of UCLA Operation Mend in mind, body and spirit," says Ruta Lee. "And, in true Hollywood style, we are having a great time doing it." The next Thalians President's Club event is an Anchors Away fundraising "booze, brunch and band" at the private California Yacht Club on June 5, 2016. Those interested in attending this exclusive soiree may contact The Thalians at 818-792-4510. The Thalians selects its honorees for their contributions to the entertainment industry and personal philanthropy. The Mr./Ms. Wonderful award was personally created and designed for The Thalians by Walt Disney himself and has become a most sought after celebrity award. The illustrious list of Thalians honorees includes: Frank Sinatra, Shirley MacLaine, Gene Kelly, Lucille Ball, Carol Burnett, Sammy Davis Jr., Debbie Reynolds, Bing Crosby, Bob Hope, James Stewart, Whoopi Goldberg, Sally Field, Mary Tyler Moore, Burt Bacharach, Sir Roger Moore, Clint Eastwood, Mickey Rooney, Hugh M. Hefner and Smokey Robinson. The Thalians' focus is now the mental health and well-being of America's wounded heroes of UCLA Operation Mend.